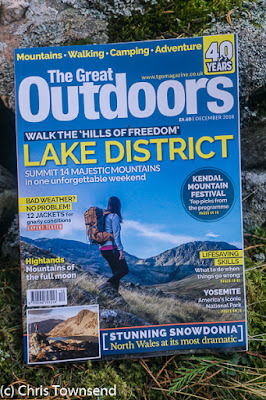 The latest issue of The Great Outdoors is out now. In its pages I review a dozen four-season waterproof jackets and the FLIR Scout TK infrared monocular and look at PrimaLoft's forthcoming biodegradable synthetic insulation. In the Hill Skills section I've contributed a short tale of going astray on Ben More on Mull. This is part of a feature called When Navigation Goes Awry which is full of useful tips from Mountaineering Scotland. In the same pages Bill Strachan from Glenmore Lodge gives useful information on what to do when things go wrong. The magazine opens with a lovely moody autumnal picture of the Langdale Pikes by Mark Littlejohn that captures the essence of the season perfectly. To mark the centenary of the Armistice James Forrest looks at the history of the Lake District mountain gifted to the nation as memorials for the fallen and walks over them all. Alan Rowan has been climbing a hill in Scotland every full moon this year, a fascinating venture, and he describes some memorable nights. Away to the south in Snowdonia there's a stunning photo essay by Nick Livesey. I particularly like the shot of Crib Goch at dawn. Back in Scotland Stefan Durkacz goes for a long walk in the Trossachs and describes in a perceptive piece how he learnt a great deal about hills he thought he knew well. Abroad Daniel Neilson visits Yosemite, one of my favourite places, and describes how it inspired John Muir and the modern conservation movement. Again there are some mouth-watering photos, especially one of the great cliff of El Capitan in evening light. There's also an interview by Emily Rodway with Cam Honan who has trekked all over the world and who has a new book out called The Hidden Tracks; a piece on Munroist extraordinaire Hazel Strachan (she's just completed her 10th round and has done a round a year the last seven years); Roger Smith on the latest climate change report; and Jim Perrin on Errisbeg in County Galway.